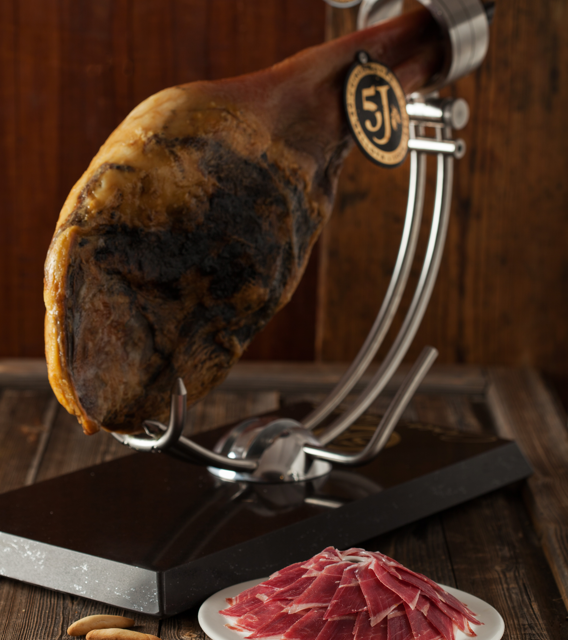 Acorn-fed 100% ibérico ham par excellence brought to you directly from the age-old dehesas (meadows) of Jabugo in southwest Spain. 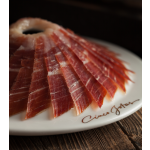 Cinco Jotas ham comes only from pure-bred ibérico pigs raised free range in the dehesas. It’s a long and slow process: a typical 100% ibérico pig takes nearly two years to reach full development, followed by about three years of natural curing in local cellars. 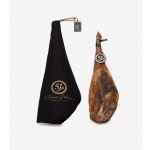 The outstanding conditions due to the unique location and climate, together with the know-how of almost 150 years of artisan mastery, has enabled Cinco Jotas to achieve the highest standards in excellence and quality. 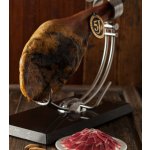 Cinco Jotas acorn-fed 100% ibérico ham is a decadent pleasure that many consider to be the most exclusive gourmet jamón in the world. With hints of acorns, wet grass and thyme, the aromas titillate your senses and kick-start the gourmet experience before it even begins to melt in your mouth. Once it does, flavors of acorns, toasted hazelnuts, wet wood and wild flowers linger in your mouth as the fifth flavor, umami, adds a final element to astound and delight your taste buds like never before. Acorn-fed 100% ibérico ham is a divine-like delicacy of nature that's good for your health. The nutritional value of this indulgence varies according to the cut and the amount of healthy fat present. Jamón ibérico is known for its high levels of healthy monounsaturated fatty acids, primarily oleic acids similar to extra virgin olive oil typical of the revered Mediterranean diet. As a result, the native ibérico pig breed is known to be called “olive trees with legs”. To properly conserve and extend the ham shelf life, store in a cool, dry place, with the ideal serving temperature between 64-72º F.
Once the ham is “open” (fat removed), carve short, thin (almost transparent) slices to fully appreciate its aroma and intense flavor. Best served sparingly on a flat plate, with samples taken from different parts of the ham to balance flavors and textures. The ham has a pleasant, long-lasting flavor, and a powerful, intense aroma that is reminiscent of toasted nuts. Using your fingers is not only allowed, but encouraged, as it’s the best way to savor and enjoy the full jamón experience. 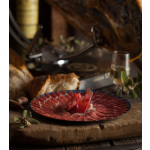 There are endless ways to eat Cinco Jotas acorn-fed 100% ibérico ham to enhance it’s flavor - with bread and tomato, in a sandwich, or as a simple aperitivo – transforming any recipe into a gourmet dish. A glass of Manzanilla fine sherry, Spanish cava sparkling wine, or champagne brings out the superior flavors even more. All Cinco Jotas products fully comply with Spanish and International health regulations and certifications. The legendary Cinco Jotas brand began in 1879 in Jabugo, southwest Spain, and has enjoyed international renown ever since. Declared a Biosphere Reserve by UNESCO, Jabugo has been famous since the Middle Ages for the art of producing the most exclusive acorn-fed 100% ibérico gourmet ham in the world.